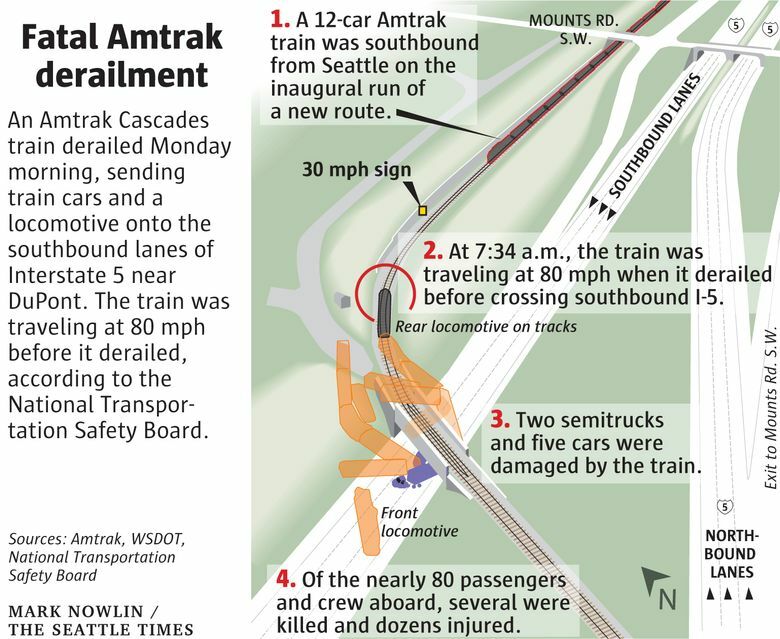 The Amtrak train that derailed Monday morning on its inaugural trip through a faster railway route was supposed to slow dramatically, to 30 mph, before entering the curve where the crash occurred. 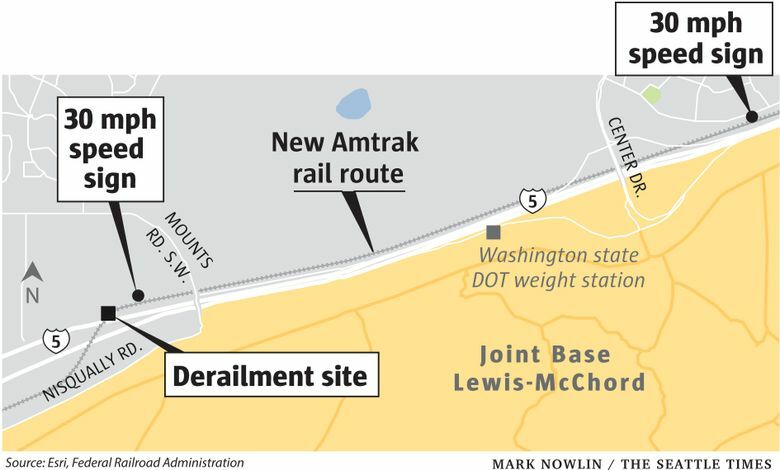 The Amtrak train that derailed Monday morning on its inaugural trip through a faster railway route was supposed to slow dramatically before entering the curve where the crash occurred. The speed limit at the curve where the train crosses Interstate 5 is 30 miles per hour, said state transportation department spokeswoman Barbara LaBoe, while the speed limit on most of the track is 79 mph. She said speed-limit signs are posted two miles before the lowered speed zone and then just before the zone. “Engineers are trained to slow trains according to posted speeds,” she said. Daniel Konzelman, who was driving on I-5 south parallel to the train, said he was traveling at 60 mph or more and watched the train pass his vehicle about a half-mile before the crash. A website that monitors locations and speeds of Amtrak trains, transitdocs.com, reported that the train was going about 81 mph shortly before the derailment, The Associated Press reported. A late-night news conference by National Transportation Safety Board (NTSB) officials verified the train was going 80 mph in the 30 mph zone. Officials said they had no other information. Russell Quimby, a consultant who was previously an investigator-in-charge for the NTSB, said it appeared to him that the derailment was caused by speed. He said the track appeared relatively undisturbed, so it seemed unlikely that something knocked the train off the track, and he noted that it appeared the train drove in a straight line, missing the turn. The railway route had recently undergone a $181 million retrofit program in order to speed up passenger service that previously traveled away from the freeway and along the coast. Part of that retrofit was to include “positive train control” systems that can prevent dangerous situations such as excessive speed. The 14.5-mile corridor is now equipped for positive train control equipment, but the train controls aren’t operating yet in that area, said Amtrak CEO Richard Anderson. An Amtrak spokesman said the equipment was still being tested. 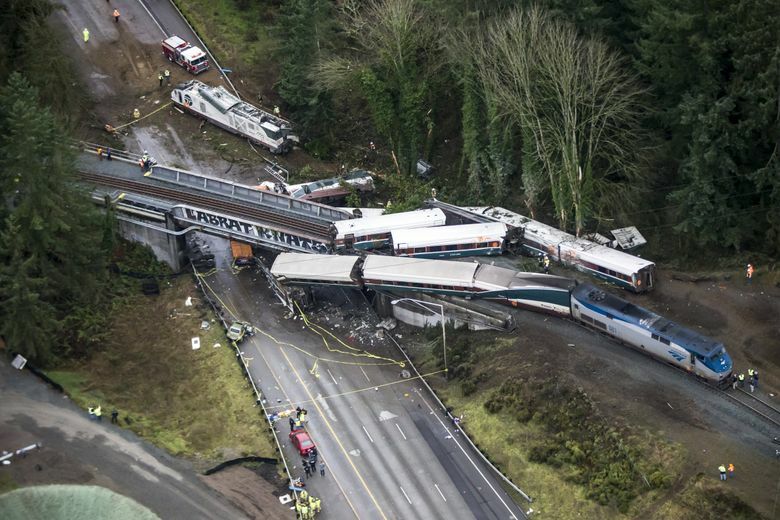 Federal safety officials have been pushing for the implementation of those control systems for years, including in 1993 after a head-on crash between freight trains killed five crewmen in Kelso, Cowlitz County. Congress first mandated in 2008 that they be put in use by the end of 2015. Since then, other fatal passenger-train accidents have also come from speeding trains that did not have the train control system installed. That includes 2013 Metro-North commuter train in the Bronx and a 2015 Amtrak crash in Philadelphia, when a train traveling more than twice the speed limit went off the tracks, killing eight people. 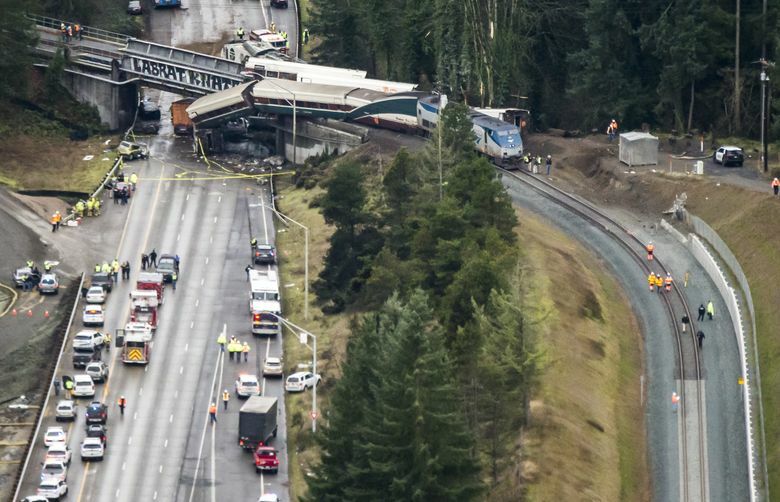 In Washington state, Amtrak suspended a train engineer earlier this year after a derailment near Steilacoom, Pierce County. Officials blamed speed and human error in that case, saying the engineer approached a drawbridge going faster than the 40-mph speed limit. While there has been progress on implementing train controls – Amtrak says it completed installation in 2015 of the systems on most Amtrak-owned routes on the Northeast Corridor – the congressional mandate on train controls has been delayed until the end of 2018. Lawmakers have also left open the possibility of another delay until 2020. Deborah Hersman, a former NTSB chairwoman who now leads the Chicago-based National Safety Council, said the technology is old and already in use in European and Asian countries with high-speed rail systems. Times staff reporters Christine Willmsen, Evan Bush and Mike Lindblom contributed to this report.